Citation: C N Trueman "Atomic Bomb"
The atomic bomb was first used in warfare at Hiroshima and Nagasaki in August 1945 and the bomb played a key role in ending World War Two. The atomic bomb (A bomb), created via the Manhattan Project, was first exploded at the top secret base of Alamogordo on July 16th, 1945. The bomb that dropped on Hiroshima was code-named ‘Little Boy’. The amount of energy ‘Little Boy’ generated when it exploded was the equivalent of a 15 kiloton TNT explosion – yet the above photograph shows that the bomb itself was relatively small despite its huge explosive capability. Half of that energy was consumed when the explosion generated an ultra high air pressure which resulted in a very strong bomb blast. One third of the rest of the energy created was consumed when the explosion generated heat, while the rest of the energy that was created was consumed in the creation of radiation. Directly beneath the centre of the explosion (the hypocentre), the temperature rose to about 7,000 degrees F. Directly underneath the hypocentre and not far from this point the damage was massive. Yet buildings etc that had areas protected by a human body were relatively unchanged as the body had taken the full impact of the heat and had absorbed it. The heat created was so great that clothes caught fire on people over one and a quarter miles from the centre of the explosion; roof tiles a third of a mile away melted. ‘Little Boy’ also created ultra high pressure. The wind speed on the ground directly beneath the explosion was believed to have been 980 mph and this speed generated a pressure the equivalent to 8,600 lbs per square feet. One third of a mile from the bomb blast, the wind speed was thought to be 620 mph which created a pressure of 4,600 lbs per square feet. Such a force would simply flatten most buildings – which is why the post-bomb photographs of Hiroshima show barely any buildings standing. One mile from the centre of the blast, the wind speed was still 190 mph and this speed created a pressure the equivalent of 1,180 lbs per square feet. Such a force would still be very capable of bringing down the most sturdy of buildings. The explosion of ‘Little Boy’ also created alpha, beta, gamma and neutron rays. Alpha and beta rays were absorbed by the air but gamma and neutron rays did reach the ground and it was these rays that affected the people of Hiroshima. Radiation poisoning killed many people in the city. Nearly all the people who survived the bomb blast but lived within a half-mile of it died within 30 days. People who entered the zone around where the bomb had been most devastating were also exposed to very high levels of radiation if they did so in the first 100 hours after the explosion. Deaths from radiation were very common for years after the explosion of ‘Little Boy’. The city government of Hiroshima kept records from 1952 on but it is estimated that from August 1946 to 1952, some 60,000 people died of radiation poisoning – an average of 8,500 a year. Maybe as many as 200,000 people died as a result of ‘Little Boy’. ‘Little Boy’ and ‘Fat Man’ (dropped on Nagasaki) had some differences in the way they were designed. 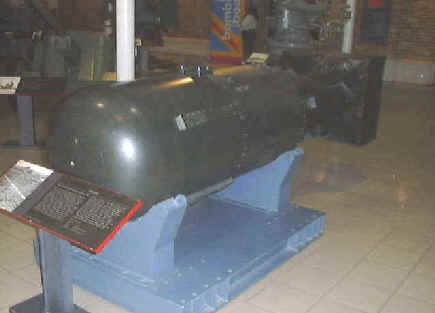 ‘Little Boy’ was a ‘gun-type’ weapon shooting a piece of sub-critical U-235 into another -cup-shaped piece to create a super-critical mass – and a nuclear explosion. ‘Little Boy’, below, weighed about 9,000lbs, was 28 inches in diameter and 10 feet long. 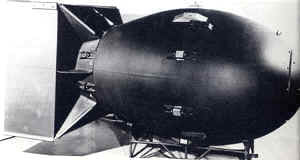 ‘Fat Man’, below, used an implosion method, with a ring of 64 detonators shooting segments of Plutonium together to obtain the super-critical mass that would create a nuclear explosion. More heavy than ‘Little Boy’, ‘Fat Man’ weighed 10,000 lbs and was 10 feet 8 inches long and had the explosive equivalent of 20,000 tons of high explosives – about the same as ‘Little Boy’.